Tonight, the tour heads to Gaffney, SC. 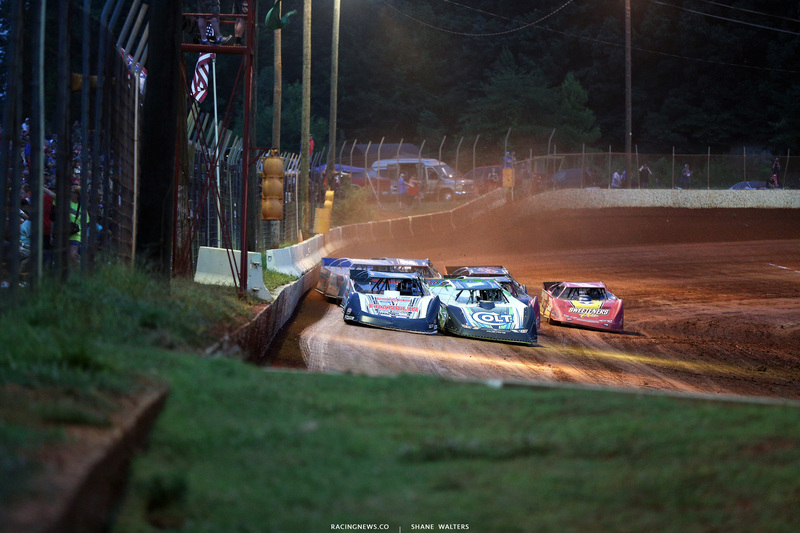 The high banked 3/8-mile oval of Cherokee Speedway is set to host the Lucas Oil Late Models. 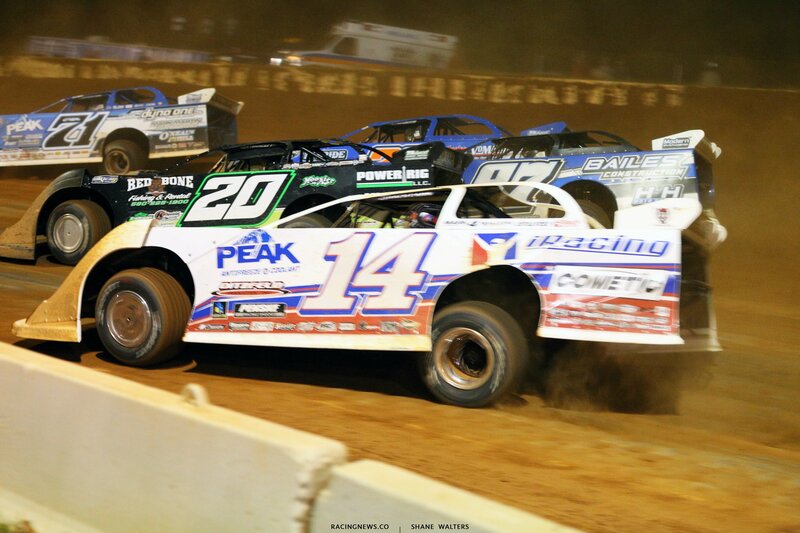 View full Cherokee Speedway race results below. Mason Zeigler tagged the turn 1 wall in hot laps. Right front and right rear damage. Josh Richards was quickest in group A qualifying with a 15.061. Hudson O’Neal was quickest in group B with a 15.212. Josh Richards and Brandon Overton will lead them to the start in the first heat race of the night. Green, Overton and Richards fight for space into turn 1. Overton runs wide into turn 1. He falls to 3rd off turn 2. Pierce moves to 2nd but Richards pulls away. Josh Richards wins heat race number 1! Michael Brown and Brent Dixon set row one in heat race number two. Green, Brown leads on the bottom into turn 1. 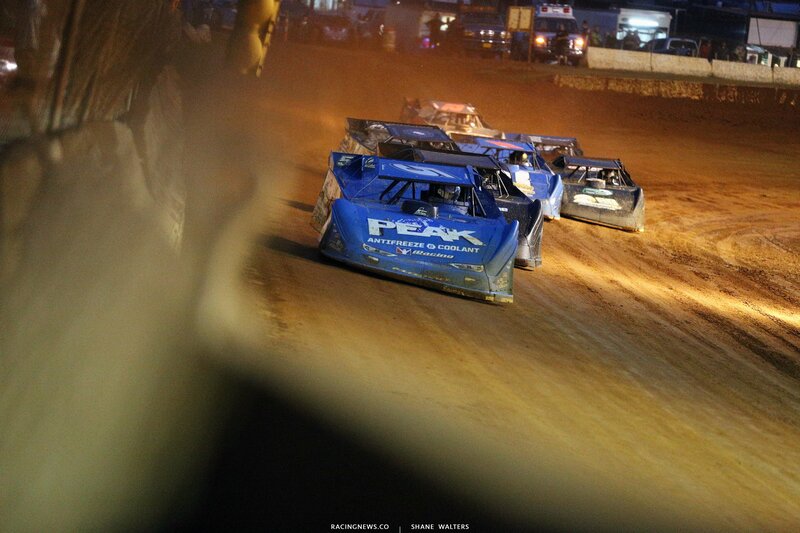 Bloomquist jumps the cushion and they all drive underneath him. Problems off turn 4, the leader has broken. The caution is out and he heads for the pit area. Green, Brent Dixon leads. Erb runs 2nd. 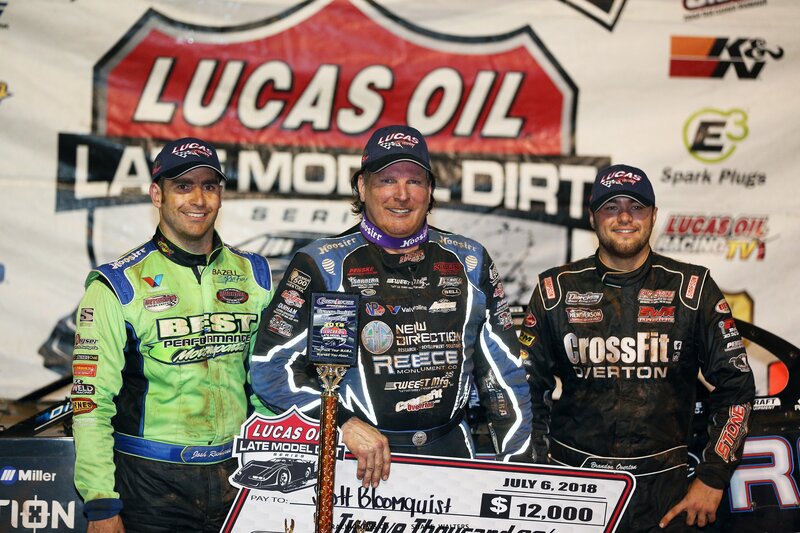 Ross Bailes 3rd and Bloomquist fights for the final transfer spot. Mechanical issues for Brown. The leader slows. Dennis Erb Jr assumes the lead. Dennis Erb Jr drives off to win heat race number two! Hudson O’Neal and Darrell Lanigan trail the pace truck ahead of heat race number three. Green, Hudson O’Neal leads into turn 1. Lanigan nearly tags the wall. Lap 5, Davenport sits in the final transfer spot. Lanigan is closing on him. Brett Hamm lost a motor just in front of Davenport. Davenport is hard on the brakes. Lanigan pitches it sideways and runs into the back of Davenport. They’ll both continue. Green, Hudson O’Neal leads Dennis Franklin by 3 car lengths into turn 1. He checks out and drives off to the win in heat three. Kyle Bronson and Gregg Satterlee set the front row in the final heat race of the night. Green, Bronson and Satterlee run wide into turn 1. Don O’Neal drives under the both of them. O’Neal is clear in the lead off turn 2. Kyle Bronson has to jump on the brakes hard in turn 3 and wait for the car to rotate. He loses a position. Zach Cox is slow down the back. The caution is out. Cox gets a tow to the pit area. Green, Don O’Neal leads, Satterlee 2nd. Don O’Neal drives off to win the final heat of the night! Josh Richards and Hudson O’Neal will lead them to the start of the 50 lap main event. 4 wide salute and we’re ready. Green flag, Hudson O’Neal wins the battle on the outside in turn 1. Richards runs 2nd off turn 2. Lap 2, Hudson O’Neal runs wide in turn 1. Richards was already going for the slider anyway. He’s clear by 4 car lengths off turn 2. Bobby Pierce is up in smoke. The caution is out. Green, Richards leads by 3 car lengths into turn 1. Hudson O’Neal holds 2nd. Bloomquist is up to 3rd. Lap 7, caution for debris. Green, Richards leads. 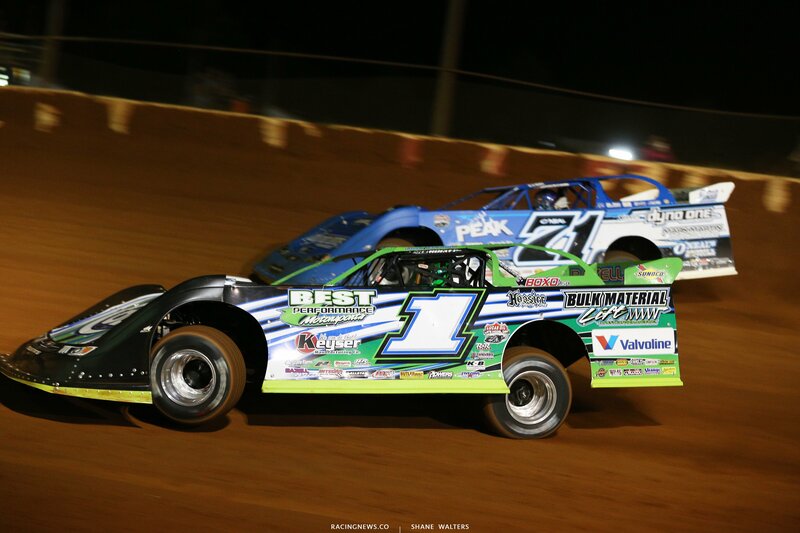 Bloomquist and O’Neal fight for 2nd. 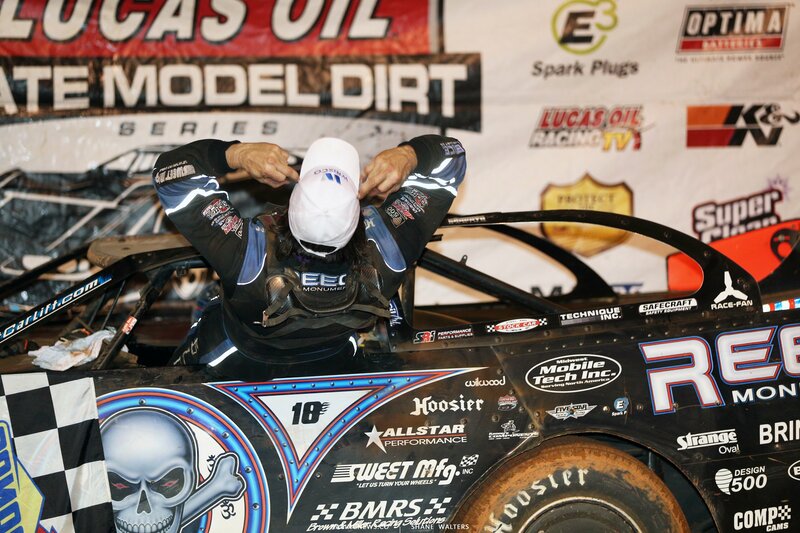 Bloomquist pinches him on the bottom into turn 1. He’s back on the gas, Bloomquist to 2nd off turn 2. Lap 11, caution as Millwood slows. Green, Hudson O’Neal retakes 2nd. Bloomquist takes it back by diving to the inside in turn 1. The leaders race through lap traffic. They run nose to tail on the bottom with Overton coming quickly. Richards is searching, he moves to the high lane. 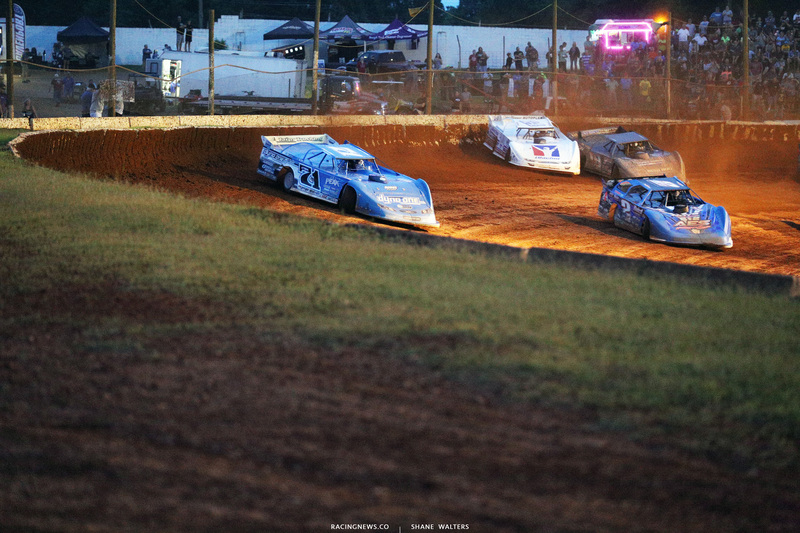 Bloomquist pulls the slider, he takes the lead. Caution for Benji Hicks. Green, Bloomquist leads. The leaders run the middle of the track through turn 1. Caution. Davenport to the pit area. Green, Bloomquist leads them into turn 1. They run 4 wide for 6th. Crash, several cars collected including Hudson O’Neal. Green, Overton takes over 2nd from Richards. He’s making a run for the lead. Bloomquist moves to the cushion in turn 1. Overton follows. They run nose to tail for the lead. 2 to go, Bloomquist has opened the lead to 4 car lengths. 1 to go, Overton cuts it to 1 car lengths. 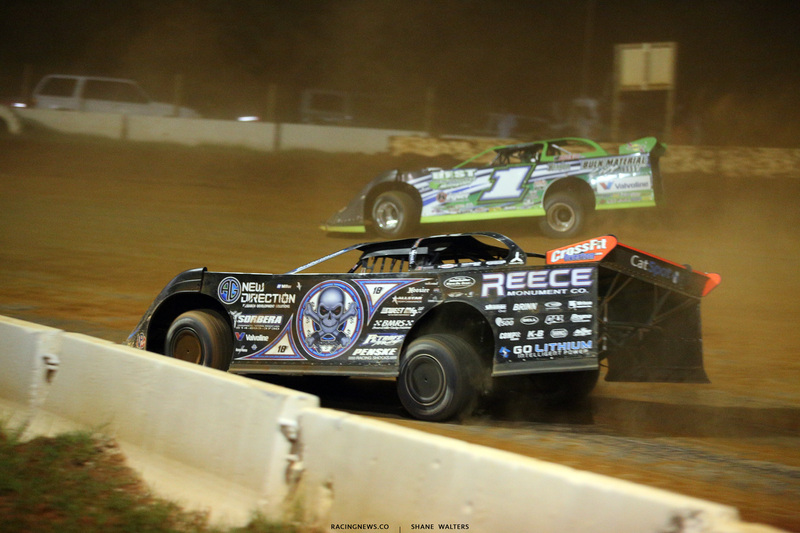 Bloomquist holds him off to take the win at Cherokee Speedway! 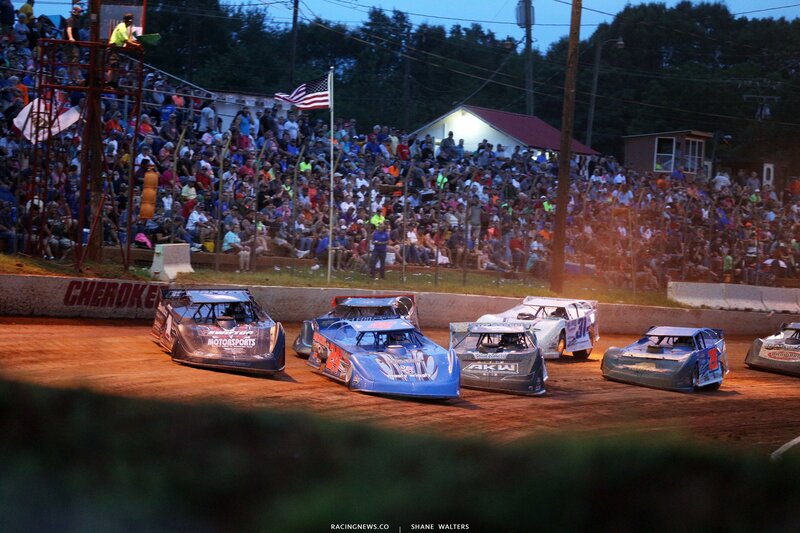 Next up, the week of racing comes to a close tomorrow night at Smoky Mountain Speedway. View full Cherokee Speedway results below.